← Pawsitive News: Air Canada Saves Simba! Yes. It’s official. I’m running for president. There are just too many people on the clown bus and I can debate better than anybody. You can count on me. For any and everything. In my world, everyone is entitled to everything. Green beans cure all. And diversity is the norm – from fur to fins and purrs to paws – all are welcome to do as they please. But just don’t get in my way. I’ve got Scottitude and I’m not afraid to use it. This entry was posted in The Scottie Chronicles and tagged clown bus, dogs, pets, politics, presidential debates, Scottish Terriers, U.S. presidential race. Bookmark the permalink. You’ve got my vote, Stuart! 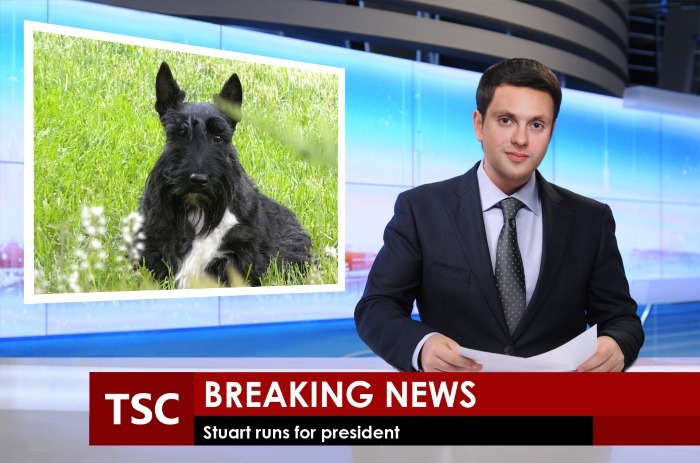 It’s about time there was another Scottish Terrier in The White House again! I’ll bring my own bucket. I don’t trust ANY CLOWN!!! Ahhh! That’ll cinch it for me! You GOT it! Promise. And I mean it. That ought to trump The Donald. He is one mess isn’t he? Ah Stuart, you dah man! I try my best and thank you for your support. Sounds like a plan for you to run.You are old enough in dog years and have a lot more common sense than most of the clowns in this circus. I think so too! I’ll even put a red nose on my face and STILL be smarter than the others. Ya got our vote, Stu! Best news we’ve heard in a very long time. Woot Mon!! You have my vote. The White House needs another Scottie running things. You have our vote! Did you get your fur stolen yet? I get mine done at home. Did you see me over at Sweet Williams’ Bolg? No stuff in my beard, I was in disguise! Noodledog!!!!! I’m hopping over to Sweet William’s to take a look! Hey, don’t worry about having no blog. We’ll all talk about you enough so you don’t have to have one. Barking a’cha! Oh Boy! Now there’s a candidate I can vote for! I wanna be your Campaign Manager, Stu! I really believes in your Cause! You are da BESTEST candidate for da job, and you exude Scottie-tudinous CHARISMA! You is da best! Wow, what a commanding presence you have! So glad you decided to throw your hat in da Scottie Party ring! Dat is da Bestest Party! No stuck up 1% in dat party! Stu, what’s your position on fences? I would vote for you! Haha! Are you looking for a running mate.